April 21: Game at 5pm! Since our location and time change, we have a weekly bulletin. verizon.net email addresses do not work. To thwart spammers, please write Ultimate here. Thanks! I haven't yet played Greenbelt Ultimate. Due to spammers, please do not include HTML or URLs. Thanks! We play Ultimate almost every Sunday afternoon in Greenbelt. Ultimate is an energetic, non-contact sport played on a field using a frisbee; the disc is passed among teammates with the intent of scoring goals in their endzone. It takes about 4 minutes to learn the basics. For an introduction to Ultimate, see Ultimate for beginners. For comprehensive information, see the Ultimate Players’ Association. No experience required. Women and men welcome. We play every week—year round—that the field is playable, free of thunderstorms, and not utterly miserable. Wear athletic clothes suitable for the current weather. If convenient, bring light and dark upper garments for team identification. Shoes with soccer or football cleats are handy, too. Many of our players live in Greenbelt, but others come from throughout the region—Columbia, Silver Spring, Lanham, Cheverly, Lothian, Bethesda, Baltimore, Rockville, Laurel, Washington DC, and Northern Virginia. 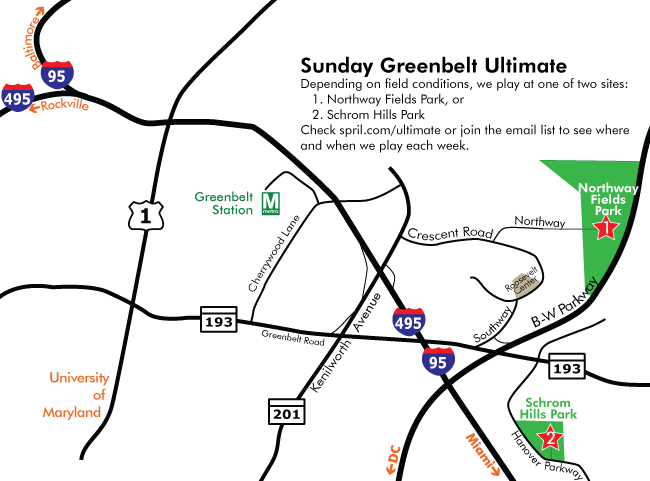 For more information about Greenbelt Ultimate, complete the form, email Tom Jones, or just show up! The Goddard Ultimate Frisbee Club has similiar games Tuesday and Thursday at Goddard Spaceflight Center in Greenbelt East; write to kogut@stars.gsfc.nasa.gov for more information. Watch this page for updates as the time changes from season to season. Most weeks we play at Northway Fields Park (#1 on the map). When those fields are soggy or unavailable, we play at Schrom Hills Park (#2). To see where and when we play any given week, sign up for our email list above, or see the red box at the top of this page. Roosevelt Center is close to Northway Fields, and has a convenience store, gas station, grocery store (open until 6pm Sundays), a Chinese restaurant, and the New Deal Café (open until 8pm Sundays, serving Lebanese food with live music in one room and a beer & wine bar), plus Greenbelt Makerspace for tinkering before a game. Northway Fields Park: Google Maps to Northway Fields Park. Schrom Hills Park: Google Maps to Schrom Hills Park. Northway Fields Park: Enter the destination “1 Northway, Greenbelt Maryland” into your GPS. When you get there, continue down the unpaved road into the park. Schrom Hills Park: Enter the destination “6915 Hanover Parkway, Greenbelt Maryland” into your GPS. When you get there, come to the softball field on the right.